Coming to Santa Monica… OVO! I’ve always been a fan of Cirque du Soleil, and have seen many shows. Iris, a permanent fixture at the Kodak Theatre, and Ovo, which was opening in January at Santa Monica Pier. I was debating which show to get tickets for. Ultimately, I decided on Ovo, as it was here for a few weeks. Even though I wasn’t keen on driving to Santa Monica, Iris was at a larger venue and the tickets were more expensive. 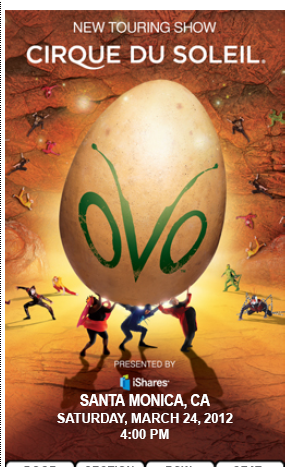 Ovo (Portuguese for “egg”), was created and directed by Brazilian dancer/choreographer Deborah Colker – the first woman to create a Cirque production—that heavily relies on Brazilian music and some dance performances mixed in with the traditional circus arts; premiered in Montreal in 2009 and is currently touring North America. The show looks at the world of insects and its biodiversity where they go about their daily lives until a mysterious egg appears in their midst, as the insects become awestruck about this iconic object that represents the enigma and cycles of their lives. Jeff got me these tickets for my birthday, and I picked the last weekend, closest to my actual birthday. This will be his first time attending a Cirque show, so I hope he likes it.